Sometimes simple is better. A good example is light therapy for Alzheimer’s disease sleep disorders. The part of the brain that controls our wake-sleep cycle is the suprachiasmatic nucleus. That cycle can sometimes get out of whack. Jet-lag is an example of that, and how we feel when it happens. Jet-lag is quickly corrected by the day-night cycle of our new time zone. Dementia can damage the suprachiasmatic nucleus, resulting in the sleep disorders that are often associated with a disease like Alzheimer’s. A good therapy light can help restore a more natural sleep pattern. The risks of sleep-inducing medications for older people who are cognitively impaired are considerable. They include increased risk for falls and fractures, confusion, and a decline in the ability to care for oneself. If you find it necessary to use sleep medications, discontinue them after a regular sleep pattern has been re-established. Most people function on a wake-sleep cycle that corresponds to our 24 hour day. The mechanism that controls that cycle is known as circadian rhythms. Anyone can have that cycle interfered with, resulting in sleep disturbances that are usually very temporary. Jet-lag is a good example of an event that can cause such a disruption; one that many of us have experienced. Getting over jet-lag is usually just a matter of letting your brain adjust to the new time zone. The day-night cycle is mostly responsible for that adjustment, responsible for resetting your circadian rhythms. The risks of sleep-inducing medications for older people who are cognitively impaired are considerable. Sleep disorders are often associated with Alzheimer’s disease. Insomnia and the related daytime sleepiness are two symptoms that a person with Alzheimer’s often experiences. Sundowning is another. Sundowning is an increased agitation that occurs in the evening and is often accompanied by wandering. Sleep disorders of this type are not a minor problem. It imposes an added burden on a care-partners already difficult position, and wandering can be dangerous and even fatal. Unfortunately, the disruption in the circadian rhythms of a person who has Alzheimer’s disease is not as easy to fix as jet-lag. It doesn’t result from a vacation or business trip, but from brain damage caused by the disease. The suprachiasmatic nucleus is responsible for regulating our circadian rhythms. The suprachiasmatic nucleus (SCN) is the part of the brain that controls circadian rhythms. 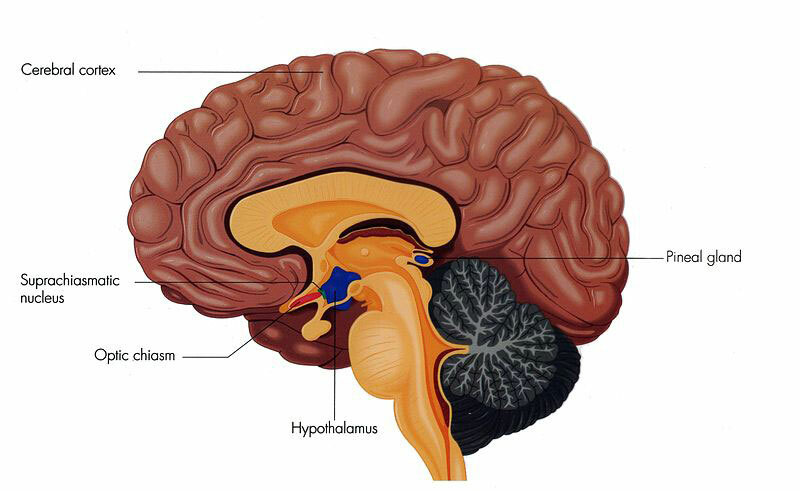 The SCN is located within the hypothalamus, in the base of the brain. (Read more about the brain>>) Researchers at the Netherlands Institute for Brain Research found a marked decrease in the total cell mass of the suprachiasmatic nucleus in older people (80 to 100 years), and an even more pronounced reduction in people with Alzheimer’s disease (mean age 78). This shrinkage could account for the sleep disorders that many people experience as they age (waking in the night or too early in the morning, daytime napping, etc.). These and other disorders common in the elderly are more common and more pronounced in people with Alzheimer’s disease and many related forms of dementia. There is a direct neural connection between the eye and the suprachiasmatic nucleus. The light-dark cycle controls our circadian rythms, and light can be used to reset those rhythms when they get out of kilter. The use of light therapy for Alzheimer’s disease can help lessen the sleep disorders that can be so much a part of that and other types of dementia. One of the characteristics that a circadian rhythm must have to be considered genuine is that it can be reset by an external stimulus. Each day the light/dark cycle and other environmental stimuli help maintain the rhythm so that it stays synchronous with the 24-hour day. If, however, the suprachiasmatic nucleus is destroyed completely, the sleep/awake cycle will be totally disrupted. This inexpensive by effective therapy light is available on our store. We should expect, then, that partial damage to the suprachiasmatic nucleus will effect sleeping patterns, not completely but to some extent. This expectation is in agreement with the clinical findings: People with Alzheimer’s disease and with other types of dementia that result in shrinkage to that part of the brain suffer more sleep disorders than otherwise healthy people of the same age. An increasing amount of evidence shows that bright, full spectrum light, on the magnitude of 5000 LUX to 10,000 LUX, can reset the circadian rhythm in people suffering from Alzheimer’s. Daily exposure to this type of light helps dementia patients with sleep disorders sleep longer and spend more time in deep sleep. As an added benefit, cognitive deterioration slowed with regular exposure to bright light, and symptoms of depression decreased. Natural sunlight is the best light therapy for Alzheimer’s or anyone else whose sleep cycle may be off. However, sufficient exposure to sunlight is not always possible. This is especially true in cold, winter months, and for people with limited mobility, and limited access to the outdoors. A therapy light that meets the requirements (full-spectrum, 10,000 LUX, etc.) is a suitable substitute. …the simple measure of increasing the illumination level in group care facilities ameliorated symptoms of disturbed cognition, mood, behavior, functional abilities, and sleep. Melatonin improved sleep, but its long-term use by elderly individuals can only be recommended in combination with light to suppress adverse effects on mood. The long-term application of whole-day bright light did not have adverse effects, on the contrary, and could be considered for use in care facilities for elderly individuals with dementia. Has this been tested on patience with neurosarcoidosis? Hi Gracie – I can find no research relating full-spectrum light therapy to neurosarcoidosis. 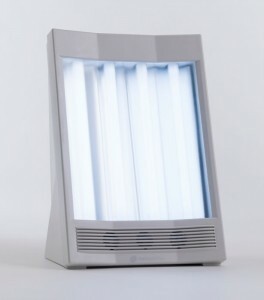 This type of light therapy is generally used in cases of sleep disorders caused by disturbance to our circadian rhythms. Such sleep disturbances often accompany dementia, if the dementia affects the suprachiasmatic nucleus, the part of the brain that regulates those rhythms. If neurosarcoidosis cause sleep disorders resulting from disrupted circadian rhythms, bright light therapy might be worth a try. Very bright white light with a modulation of 40Hz has been shown to be beneficial.